The Chicago Bears head into their week five match up against the Carolina Panthers without their quarterback and leader Jay Cutler. Instead, Todd Collins will get the start due to the concussion Cutler suffered in week four. The Bears made the announcement of Collins starting on Thursday, and began a four day panic period for Bears fans all over. Can Collins lead the Bears to a victory against a bad Panthers team? Can he get them back on track? Can he make Bears fans believe they are still good enough to compete for the title in the NFC North? All of these will be answered Sunday afternoon in North Carolina. Obviously Collins isn’t the guy that’s going to lead the Bears to a potential NFC North Division Championship. He just needs to be good, and do his job this one week. He’s not going to be Jay Cutler. He wont put up 300 passing yards, and two touchdowns. But what he brings to the table that Caleb Hanie doesn’t have is experience. Collin’s last NFL action prior to last Sunday Night was in 2007 for the Washington Redskins. He came in the game against the Chicago Bears when Jason Campbell was hurt. Collin’s rallied the ‘Skins to three straight victories and a playoff berth. The Bears travel to North Carolina and are playing a Panthers team that desperately needs a win. The Panthers aren’t very good, but there is some talent on that team. With their best player, Steve Smith, out for the game; the Panthers will rely on running backs Deangelo Williams and Jonathan Stewart. The Bears know what Stewart can do to them, evident in their last meeting in 2008 where Stewart tore through the Bears defense in the second half, leading the Panthers to a win. This years defense is better than the 2008 defense, well at least it’s shown it is for the first four games.Aside from Ahmad Bradshaws 100 yard performance last week, the Bears defense has shut down the run game and will look to do so Sunday too. North Carolina is also the state where new Bears defensive end Julius Peppers spent his whole life playing in. Sunday should be a great homecoming for Peppers, especially if the Bears can get a big win. The Panthers have rookie quarterback Jimmy Clausen starting, who has looked bad so far this season. So I expect this game to become one dimensional on the Panthers offensive game. If that happens, the advantage goes to Chicago’s defense. Clausen isn’t scaring anyone on the Bears defense. If the Bears ever needed something to fix their cure for a terrible week last week, it could be Clausen. Expect the Bears to pin their ears back and go after the youngster. The Bears will need to establish their run game and establish it fast. With Collins starting, their wont be much action in the air deep. So a nice run game will setup some play action for the veteran quarterback. The Bears have still failed to put out a solid run game this season with Matt Forte and Chester Taylor. If they want to be successful this season, it needs to happen now. No excuses. Just get the job done. If Chicago can establish a run game, they can put the game away early. 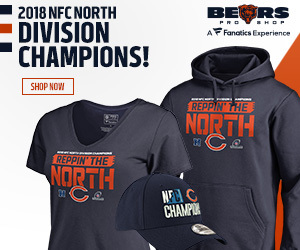 With their embarrassing loss on national television last week, the Bears can still use this as a game to prove they are worthy of being in the top half of the NFC. If you want to be good, these are the games you need to win. You know, the games that you are supposed to win. Even without their star quarterback, your expected to win these games. Establish the run game early. I know I’ve said this before, but this really needs to happen this week. With Todd Collins at quarterback, the run game has to click on the offensive end for the Bears. A good run game will open up things for the veteran Collins. Be dominant on defense. The Panthers have a set of game breaking running backs; but they also have a rookie quarterback at the helm. Don’t let Jimmy Clausen beat you. Take care of the run game and dominate on defense. Special Teams could win it. Everyone is talking about Collins in this game, but the Bears special teams is a major key. Putting the Panthers offense in their own territory is huge for the Bears defense. Hester must get it going in the return game. ← Cool under pressure, Glawe leads West to big win.